On YouTube deservedly led the top video sharing today worldwide. If you like to shoot your own videos, but you do not share with anyone, then the system is just perfect for you. In addition you will be able to share their material, not only with your friends, but with complete strangers. Also, if you are a site owner, You can set the player code to your site, thus distributed video clip. Some people earn a lot of money on the show rolls, but it is necessary to make respective reputation and credibility, the only way users will follow your updates. To make it easier to keep track of your video, you can create a channel, where to store all the materials. In this article, let's talk about, how to create a YouTube channel and, it would take for that. First we need to create a new account in the system. To do this, you can sign up for the service gmail.com, as well as Google practicing bind all accounts, Along with this you will have a profile in Youtube. Also you can use other functions, offered by Google. 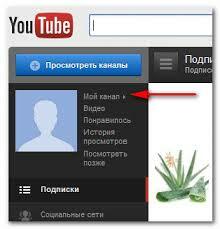 Earlier we examined, how to create an account on YouTube, You can use this manual. Again go to “My channel” and select “Settings”. multiple tabs are present here. Appearance – responsible for setting the background, avatars and other graphical settings. for example, you can set any desired background color. For creative people, an apparatus of the background image. Keep in mind, that you need to upload an image to the size of 1500-2000 px. At the same time, the file size should not be more than 1 MB. This material you can get, using special software or download the final image on the network. To download from your computer background, click “Choose background image” and guide the path to the file. The “Info and settings” is responsible for the name of the channel, description, etc.. functions. Here it is necessary to write a little information, with the help of which the user will be able to learn a little about you and your channel. Besides, you can adjust the channel page URL to a more comfortable, beautiful and memorable. To do this, click “Edit” next to the field labeled URL. The “more” section, where you can adjust the channel private. Here, you specify who can view videos, adjust the display of comments and tags. Now you know, how to create a YouTube channel. Upload your own video, promote them and become popular. Eventually you will start earning good money.